I recently read that the plight of working moms is that we want to work as if we don’t have children and be moms as if we don’t have careers. Don’t try to balance. Juggle. You’ve heard people harp about the unrealistic ideal of work-life balance, but let me add to the rant: the word “balance” insinuates there can be an equilibrium between two priorities – in this case, work and life. Two? Really? We are constantly juggling (not balancing) the many roles, responsibilities and desires we have as mothers, colleagues, spouses, friends, daughters, sisters, community members, etc. My colleague Rita Izaguirre describes it as trying to “stand on a hammock.” Similarly, Dan Thurmon uses the example of a handstand in his “Off Balance On Purpose” TEDx Talk. We’re constantly adjusting, trying not to fall over, which is completely normal. If we’re bound to juggle, and the balls in the air keep increasing – some of which now are living, breathing, little humans – how and where do you focus? From a marketing communications standpoint, we must constantly and nimbly adjust the pieces of a campaign or responses during a crisis, because plans change. However, starting with a sound strategy and a clear set of long-term goals helps you prioritize amid chaos. It also helps you say “no.” The same goes for working moms. Five years ago, when I was pregnant with my first son, Jackson Spalding co-founder Glen Jackson said to me, “Saying no to something is saying yes to something else.” Ever since then, I try to personally identify what I’m saying “yes” to when I say “no.” There is still chaos, but focusing on the long-term in my career, my marriage and for my children, frees me of guilt and helps me constantly prioritize with purpose. It’s strategic juggling. Embrace the seasonality of the business. While the working mom business is 24-7, 365 days a year, there are still seasons. I have a four-year-old and an 18-month-old, and my third (and final) child is due in August. I’m mentally preparing for that season again where a breastfeeding barnacle will replace sleep and focused adult conversation. But I’m also taking note that this upcoming season of holding my precious newborn baby will pass all too quickly. There’s that saying, “The days are long but the years are short.” I know this is true because my oldest son’s entire third year of life was full of long days, yet here I am in awe of the fact that he’s now four and reading and writing his first words. 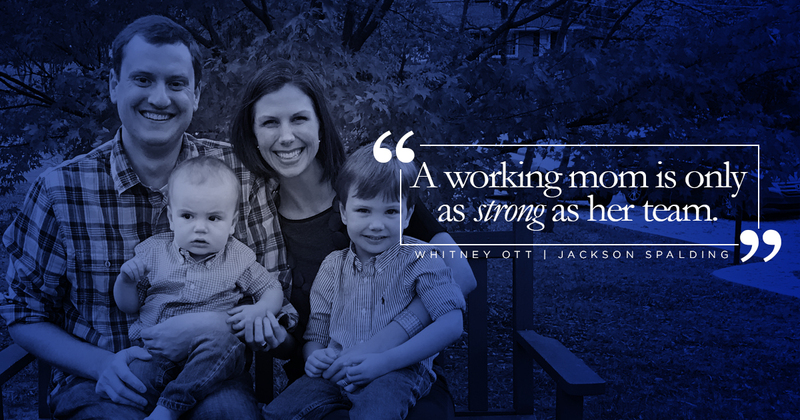 I believe women (working moms, in this case) can have it all – just not all at once. The more time that passes since the day I first became a mom, the easier this is to see. Pre-kids, I had a 10-year stretch of working my tail off, and I loved it. My now-husband, friends and even colleagues criticized me for being a workaholic. I was learning a ton, adding value to my teams and clients, and lucky enough to be working alongside people I respected and admired, and who have become some of my dearest friends and business partners. I wasn’t “out of balance.” I was focused and milking that single, childless season for all it was worth – while having a fun and fulfilling life I might add. Regardless of the season I’m in, I want to own it. Great leaders surround themselves with smart, talented people. They aren’t threatened by others; rather they intentionally attract the best and brightest to help get the job done and to exponentially multiply the impact they’re trying to make. Like any leader aiming for sustainable year-over-year growth, a working mom is only as strong as her team. My childcare team includes an incredibly involved husband, grandparents, a full-time nanny and a workplace where the leaders have always put people first. That’s the reason I’ve been at JS for more than a decade and have decided to spend my career here. My colleagues inspire me, challenge me and teach me. We’re a true team. That was the case when I started 14 years ago as a young, single intern, and it’s as true now as a working mom. We have a strong JS Moms group with monthly luncheons, mom mentors, nursing rooms and a speakers’ series for parents. An incredible work environment with people you enjoy is a must-have for working moms. It’s never too late to strengthen your bench and set yourself up for success. My career has undoubtedly shaped me as a mom. I’d argue it helps me as a mom. It can add stress, yes, but it also grounds me and helps me cope. Before kids, there was this subconscious thought that I worked for someone – a client, a team, a boss. Post kids, I fully embrace that I come to work every day for me. Just keep going and remember you want this. Learn to say no, without the guilt. Smile and learn to fake it when necessary. Schedule time and give yourself permission to enjoy both work and family. Take it day-by-day; don’t try to over plan. Realize there are phases that you’ll cycle through. You may be on the back burner for a season, but you’ll be back out in front soon enough. If you want to get it done, write it down. Don’t expect yourself to remember everything. Don’t be so hard on yourself. You’re not perfect. Do your best. It will be enough. Give yourself grace, and cry when you need to. It’s okay to have sandwiches or breakfast for dinner. Own it. Don’t apologize for it.